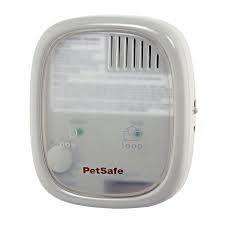 PetSafe is one of the most trusted brand names in the pet product industry. For almost 25 years they’ve been setting high standards for electric dog fences and PetSafe remains committed to providing dog lovers everywhere with safe pet containment systems and superior customer service. Since it first hit the market about 10 years ago the PIG00-10777 has been the go-to fence when it comes to effectively containing really stubborn and very large dogs. You’ll also get PetSafe’s ‘limited lifetime warranty’ which guarantees any replacement part you need within the first year will be free. After that you’ll receive a huge discount (basically you’ll only pay about 30% of the full retail price) on any part you need replaced. Along with that, you’ll get free shipping and a 90 day warranty on the replacement part. 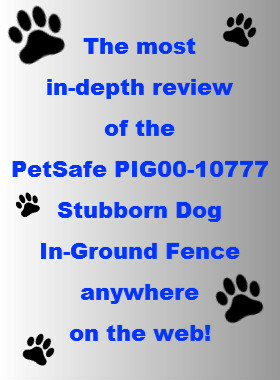 The PetSafe PIG00-10777 Stubborn Dog In-Ground Fence was created for very stubborn or really large dogs that need stronger correction levels than a regular receiver collar can deliver. While the higher intensity correction levels would overwhelm small or timid dogs, they’re extremely effective at recapturing the attention of even the largest, most difficult to train persistent pooches. If your lovable pooch falls into any of those categories, the vast majority of user reviews say you simply won’t find a more effective containment system than the 10777. I love to read stories about people who have been able to solve a big problem with a great product and the reviews on the PetSafe Stubborn Dog are chalk full of those types of stories! Without a doubt, the overwhelming majority of people using this underground fence for dogs absolutely love it. But what struck me the most was how many people went from thinking nothing in the world would work on their dog to being completely satisfied by how effectively the 10777 contained their furry friend. Whether their dog was a digger, a jumper, a master escape artist, a chaser or just one of those dogs who says “I’m big and I don’t want to listen to you”, time and again the Stubborn Dog worked like a charm! But the vast majority of dog lovers who installed this fence were completely satisfied with the result. Loads of features and attention to safety are what makes this in-ground system the go-to favorite when it comes to keeping all those hardheaded, but very lovable furry friends out of the street and safely in the yard! Across the board one of the things that users love about in-ground dog fences is that they are completely customizable! Bury the wire in the ground, attach it to an existing fence or staple it to the ground. Run it over a cement driveway or tuck it into your vinyl siding and run it up the side of your house and through your eavestroughs…the possibilities are endless. But that customization comes at a price: It’s going to take some sweat and elbow grease to get this fence up and running but compared to similar DIY dog fence models the 10777 is no more or less difficult to install. While I won’t go into the details of the installation process here, there’s one component I want to briefly touch on and that’s the transmitter. Sometimes called the ‘base’ of the system, the transmitter is the heart of any electric dog fence. While some transmitters are large and bulky, the RFA-482 transmitter that comes standard with the Stubborn Dog is small, lightweight and easy to use. Indicator lights are an important feature of any dog fence because they tell you, at a glance, that everything is OK with your system before you let your dog out. In addition to the visual wire break alarm, the 10777 also has an audible alarm that will alert you to issues with your underground fence wire. Boundary Control Switch: This switch is used to adjust the size of your containment area and you set it according to how much wire you’re using. Boundary Width Control Knob: This setting determines how far away from the fence line your dog’s receiver collar will activate. With the Stubborn Dog you can adjust that distance from about 1 foot to 12 feet. 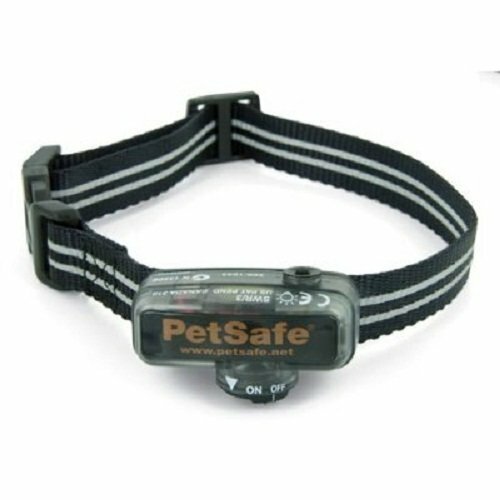 The PetSafe PRF-275 receiver collar is the strongest and largest receiver collars on the market! And there’s no doubt about it — this collar definitely gives you tons of bang for your buck, not only in size and strength but also in features. Weighing in at a whopping 6.5 oz it fits neck sizes 6″-28″ and the receiver unit on this collar measures 2.5″ long X 1.5″ high X 1.5″ wide. As I’ve already mentioned, this collar is specifically meant to be used is on dogs who simply will not respond to a regular strength static correction. Although the manufacturer states the collar is good for any dog over 8 lbs, the vast majority of people who wrote a review on the Stubborn Dog were using it on dogs in the 50 to 200 lb range. But don’t get me wrong…there are lots of people who had smaller dogs on this system. But in those cases, they purchased the fence specifically to be able to contain a larger or more difficult to train dog and purchased additional regular strength collars for their other smaller or easier to train buddies. If you live in one of those multiple dog households you can get more information on the collars that can be used with this in-ground system in the accessory section of this review. Although the manufacturer claims that it’s waterproof, I’d call it more water resistant because while it’s OK to get it wet and dogs swim with this collar on all the time, it’s not recommended for prolonged time in the water and it shouldn’t be submerged to any depth. There’s no on/off switch on the collar; once you put the battery in the collar’s on. And speaking of batteries, the PRF-275 uses a regular non proprietary 9v battery which means that you can get a replacement battery anywhere batteries are sold. The life of the battery depends on how often your dog tests the boundary but most people said they got anywhere between 3-4 months out of one battery. 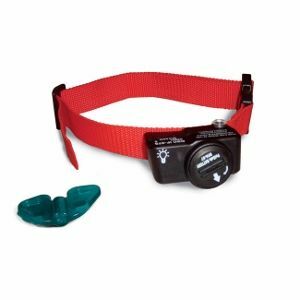 But you won’t have to worry about remembering when you last replaced the battery because the PRF-275 receiver collar is equipped with a low battery warning light to let you know it’s time to change the battery. As I’ve already said, one of the biggest complaints I found in the Stubborn Dog Fence reviews was that the nylon material the strap is made out of didn’t last very long, sometimes wearing out within the first 6 months to a year. Fortunately the receiver unit on the collar the ‘pass through’ type so if the material wears out before the receiver unit does, you can transfer it to any other non metallic collar as long as it’s at least 3/4 of an inch wide. Out of the box the PRF-275 collar comes fitted with 1/2″ metal contact points but longer 3/4″ prongs are also available if your dog is of the extra furry variety. As an added safety feature, there’s a plastic cap that has to be removed to access the Correction Level Button. This ensures that you can’t hit the button and accidentally change the level of stimulation your pet is receiving. There are 4 progressive levels of static correction on the Stubborn Dog collar and in addition to the electric stimulation, this collar will also vibrate at every correction level. Because of the collar’s waterproof features, sometimes the beep simply isn’t loud enough to get your dog’s attention. So the vibration added to the warning beep ensures your pet gets the message. Some breeds of dogs like Hounds and Retrievers can get so intent on something that they’re able to block out what’s going on around them. In these instances, the vibration gives them an extra level of warning before they get any kind of electric stimulation. The PRF-275 also has a beep and vibrate only option which is ideal for training. 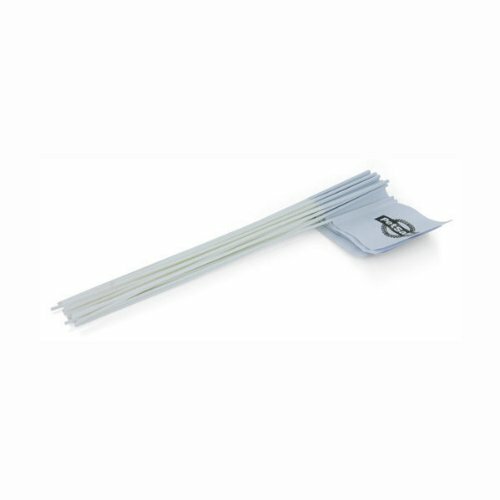 Your fence kit comes with enough wire to cover about 1/3 of an acre. 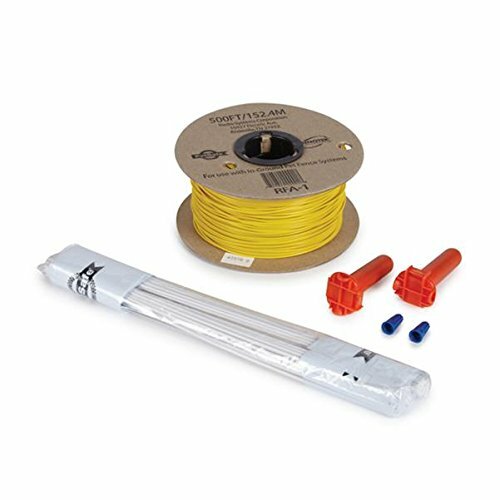 This wire and flag kit contains everything you need to extend your coverage to a total of about 1 acre. The table below gives you an idea of how much wire you’ll need. 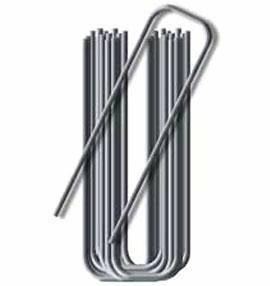 These are excellent for above ground installations where you need to secure your boundary wire to an already existing fence or to the ground. Your fence kit comes with 50 flags which is enough to cover about 3/4 of an acre. If you’re to extend your containment area beyond that you’ll need more flags. Each bundle contains 50 flags. If you’re the owner of more than one dog that needs the higher intensity correction levels, you’ll need to purchase additional PRF-275 collars. As I’ve already said, the majority of people using the PRF-275 collar had it on dogs in the 50-200 lb range. Designed for dogs 5 lbs and up, the Elite Little Dog collar weighs only 2.5 oz, fits neck sizes of 6″-16″ and has a receiver unit that measures 2.25″ long X 1.0″ high X 1.0″ wide. In addition to that, it also has 4 levels of regular intensity correction plus a beep only training mode and a low battery warning light. If you need the longer collar probes that I mentioned earlier, you can’t purchase them on their own – you have to buy an accessory pack. 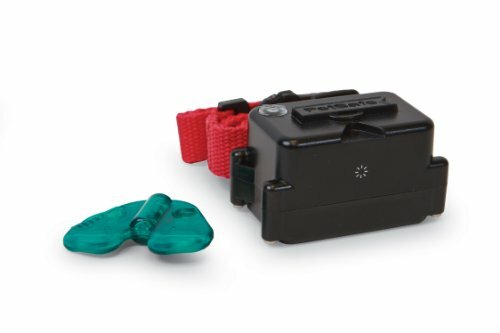 Along with a set of both the long and short metal contact points, the RFA-529 Accessory Pack also contains everything else you’ll need to replace any component on your pet’s receiver collar. 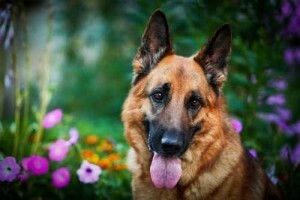 Tip: We all know that dogs, especially the large variety, can get quite boisterous while playing so it’s not hard to see how that type of roughhousing could lead to a lost prong or dislodged O-ring. For that reason many consumers added this onto their order when they bought the fence kit so that they’d have everything on hand to repair the collar when they needed to. This kit contains everything needed to help you find a break in your boundary wire. Many people said that the wire break locator saved them a lot of time and hassle. Any way you slice it, training is the most important part of any electric dog fence. Without proper training your furry friend won’t understand their boundaries and the consequences of getting too close to those boundaries. Because it’s so important I’ve written a separate article detailing how to train your furry friend to an electric dog fence.